If you only see your K-6 music students for 30-60 minutes/week, you have very limited time to assess student progress. In this article, I want to give suggestions that will help you make the most of the limited time that you have. You should plan your assessments when you create your year plan. If in the first term of your year plan, you decided to focus on steady beat, then your assessments for term one should focus on steady beat. You can’t assess every musical skill and concept each term. When planning assessments, find out what your school or districts allows or requires on the report card. If you can only report on 3 outcomes, don’t assess 20 outcomes. In planning assessments, you will want to assess both skills and mastery of concepts. Skills include singing, playing, moving, listening, reading/writing and creating. Concepts include beat/rhythm, pitch, expression (dynamics, tempo, articulation), tone color (timbre), form. Not all skills and/or concepts have equal importance. The skills that I feel are the most important in K-6 music are singing in tune, and keeping a steady beat. I might assess thost skills every term, and assess the other skills/concepts during the times that I’ve focussed on them. 1. Outcome: Students sing independently, on pitch. To Assess: Sing “hello student” on so-mi, so-mi. Student responds by singing “Hello Mrs. Gagne” back to you. 3. Proficient Sings in tune most of the time. 4. Excellent Consistently sings in tune independently. 2. Outcome: Students sing in the group, on pitch. To Assess: Play a recording of a song that you’ve worked on that the students should know. For example: The National Anthem or in Musicplay 2, Ridin’ That New River Train. Have the students stand in class list order. Walk down the rows listening to each child sing for 2-3 seconds. Record your assessment in your grading program or on your class list. 2. Beginning occasionally matches pitches. 3. Proficient Sings in tune almost all of the time. 4. Excellent Consistently sings in tune. 3. Outcome: Students keep a steady beat when moving to music. To Assess: Play the song, “Time for Music.” It’s song #1 in Musicplay PreK part 1 and in Singing Games children Love Vol. 3. (also available on iTunes and/or at www.musicplayonline.com) In this song children keep a beat, clapping, patting, tapping, flapping, and drumming on their knees. Have the students sit in class list order, observe and assess as they sing and move to the song. Another way to assess steady beat when moving to music is to play a listening example and have the children find their own way to keep a beat. 3. Proficient keeps a steady beat almost all of the time. 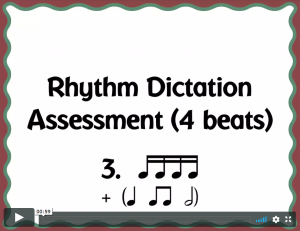 To Assess: Sing and play an instrument song such as, Play, Play, Play Along in Rhythm Instrument Fun. (This is also in Musicplay PreK, and is found online at www.musicplayonline.com) Have the students sit in class list order and give each child a pair of sticks. Observe and assess as they sing and play to the song. Alternately, play along with a piece of classical music or a folk tune. Find a piece of music that has a tempo approx.. 120 beats per minute. To Assess: Sing a short, familiar simple 16 beat reading song or chant such as Engine #9, Lucy Locket. While they sing, have the children tap the beat on a beat chart. 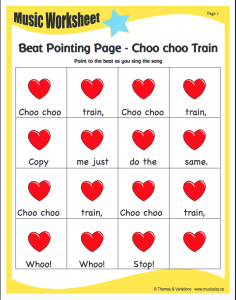 (Download a beat chart for the songs listed above from musicplayonline.com – printables) Have the students sit in class list order, observe and assess as they sing and tap the beat. 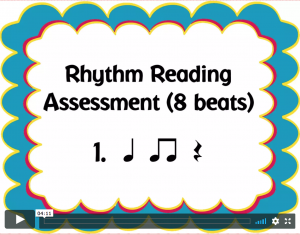 To Assess: Create a set of 10 or more rhythm flashcards. Go down your class list, having each child read one or two flashcards. Gr. 1-2 – use 4 beat rhythm cards Gr. 3-5 first report card, have students read 8 beats. Have the students sit in class list order, observe and assess as they sing and tap the beat. 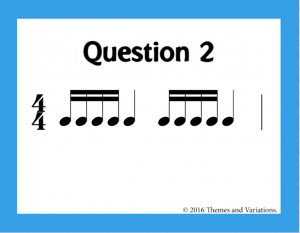 Themes & Variations publishes a set of 100 rhythm flashcards that are printed on colored cardstock. The color coding indicates the patterns included in the set and helps you to quickly find the set that each class is working on. 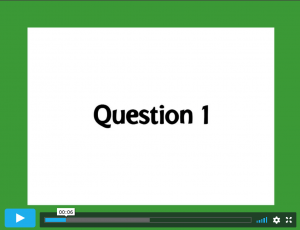 In www.musicplayonline.com, we’ve taken the flashcards and made this into a very quick and easy to use movie – just press play. There are 25-35 patterns in each set. There are fewer patterns for very easy sets as younger classes are usually smaller (we hope!) and more patterns in the harder or longer sets for your older students. 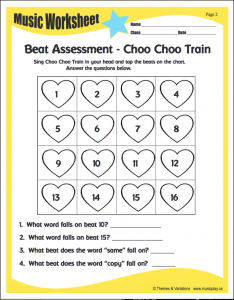 In the easier sets, we’ve given you both 4 beat assessments and 8 beat assessments. You can choose the set that you want to assess. To Assess: To do music Dictation using cardstock flashcards, I choose five cards at the level I want to assess. I give the students a piece of paper (I use paper from the recyling in the school) and a pencil (I keep a class set in a container by the door) and an old hard cover text to write on. They write their name at the top and number 1-5. I clap a pattern – they clap it back, then write it down. I’ll give it a second time if they need it. I write down my patterns as I go or keep my flashcards in order. Students exchange papers and correct them in class, so I don’t have to take home bags full of marking. Yay! Music Dictation at www.musicplayonline.com is done the same way. Five questions are given. Pause the movie between questions. Immediately following the five questions are the answers. Exchange papers and mark. 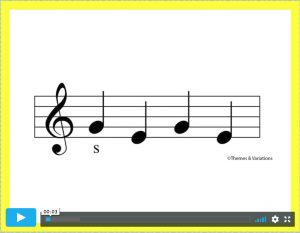 To Assess: If you use solfege in your music classes, assessing the students ability to read and sing melodic patterns may be an outcome that you choose to assess. In my classes, in first term I might assess the following patterns in term 1: Gr. 1 – so-mi, Gr. 2 – la-so-mi Gr. 3 – so-mi-re-do Gr. 4-5 – low la, do-re-me-so-la Every teaching situation is different, so this may not be an assessment that is relevant to your teaching. 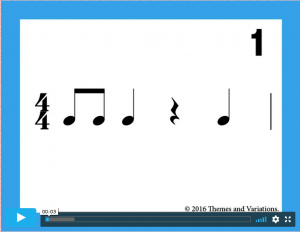 Create or purchase melody flashcards to assess the tonal patterns that you have taught. Melody flashcards are available to purchase from www.musicplay.ca. 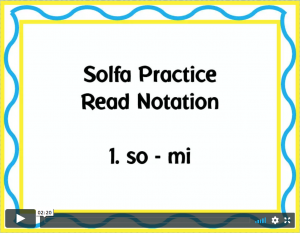 OR you can use the Solfa Reading videos at www.musicplayonline.com. 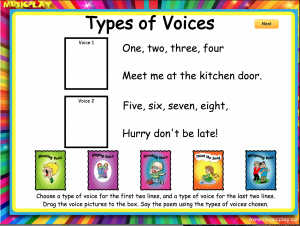 To Assess: The Types of Voices lesson in Musicplay for Kindergarten, song #7, This is My Speaking Voice, includes a printable assessment. 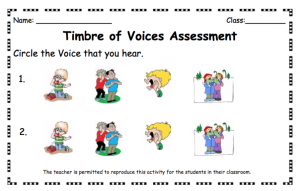 In this assessment, the teacher uses one kind of voice, and the students circle the type of voice that they heard. 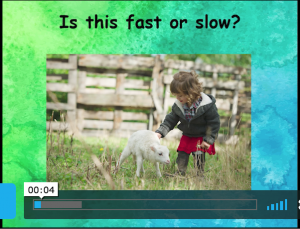 To Assess: #29 in Musicplay PreK is called Fast or Slow. 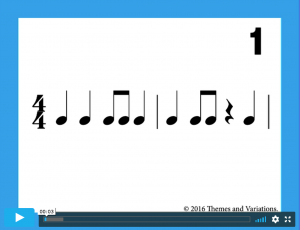 Eight musical examples are played for the students and the students tell if they are fast or slow. You could use 4-6 of these examples in an assessment. Give each student a piece of paper (I use paper from the recyling in the school) and a pencil (I keep a class set in a container by the door) and an old hard cover text to write on. They write their name at the top and number 1-4 or 1-6. Play the movie to use the musical example but don’t project it. 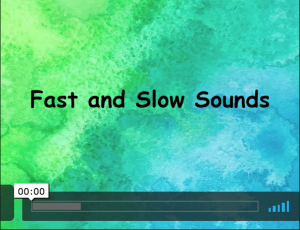 Pause to allow children to write slow or fast. (or make up a worksheet so they just have to circle slow or fast.) If you prefer, you could play your own examples on a keyboard. Mark the students work for your assessment. These are just a few possible assessments, but I hope this gives you some ideas for easy assessments that you can do in your music classes, without taking up all of your limited teaching time! This entry was posted in Assessment, Lesson Plans, Report Cards, Uncategorized on October 29, 2017 by Denise Gagne.